The Treasure Data enterprise Customer Data Platform (CDP) helps the digital marketer segment audiences for vastly better personalization by uniting siloed data to achieve a 360° view of the customer. Marketing teams have been able to increase their KPIs and enjoy ownership of the data platform in ways never before possible. But marketers aren’t the only ones enjoying a better life in the united states of data. In this blog post, I introduce another use case for the Treasure Data CDP that seamlessly and efficiently improves our customer support. This is how we sync data between systems to enable the automatic triggers for support even when some data are missing and/or needs unification. 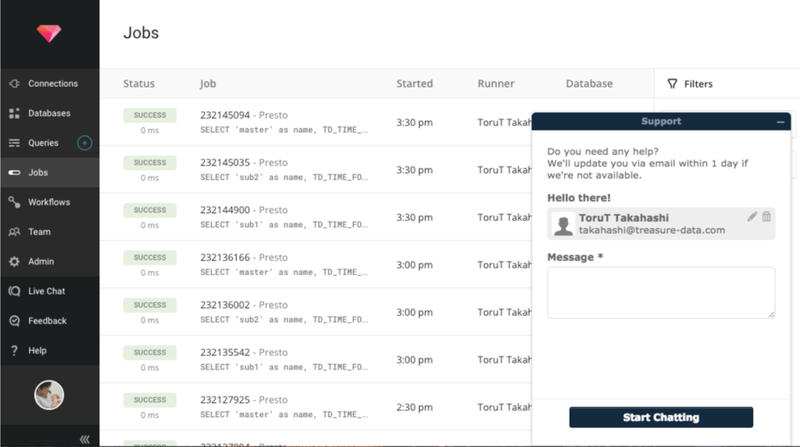 Treasure Data Support uses Zendesk for support ticket management to provide Email / Chat / Support Form to our customers. (If you are our customer, you might have chatted with us before.) We are on Salesforce for customer relationship and account management. In order to deliver great support to our customers, we want to know a requester’s background, such as their pricing plan, computing resources and subscription status quickly when we receive a request. Furthermore, in Treasure Data, there are several customer roles defined to represent their particular deployment phase; sales, solution architect, or customer success. Our support is always available for all customers even if they are in the early stage of on-boarding with their solution architect. Thus, we handle support tickets based on a customer’s status. If you are on-boarding Treasure Data, your solution architect should know all conversations between the support team and you, our customer. Transfer the inquiry to the sales rep and the solution architect automatically if a user belongs to an account under contract less than 3 months. Transfer an inquiry to the customer success rep automatically if a user belongs to an account near the contract renewal. Alert a service level agreement (SLA) when an emergency ticket from a user belonging to specific contract plan is received. 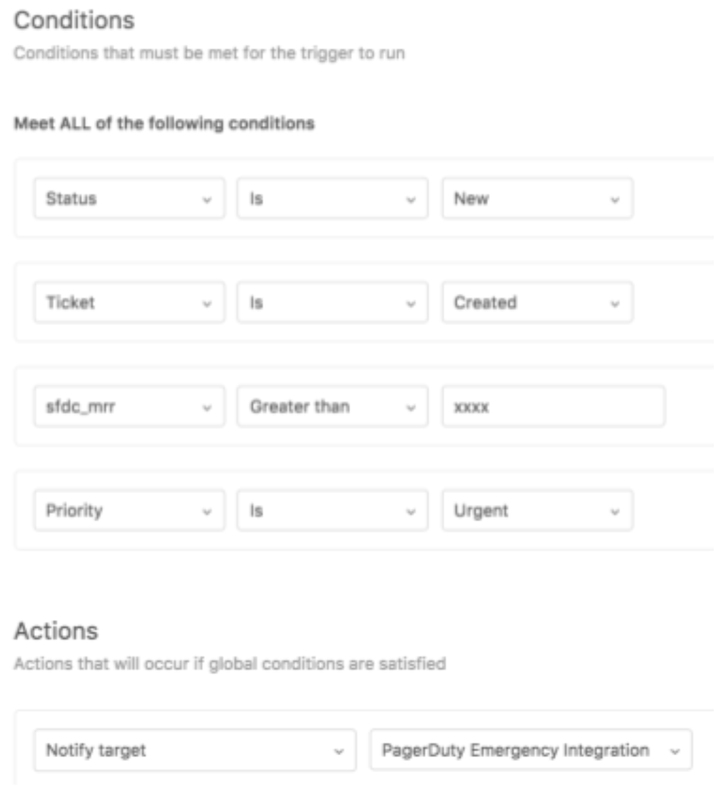 In order to run the trigger in Zendesk based on contract information such a “sfdc_mrr” in Salesforce, we have to sync data between Zendesk and Salesforce. Also, we’d like to share such a usage to the Treasure Data sales team via email. Zendesk User is based on an email basis, but SFDC is managed on an contract basis. We couldn’t link email between Zendesk User and SFDC Contract. Even if we use the Zendesk SFDC add-on, there were a lot of cases where the correct information could not be acquired. For example, a Contact in SFDC may not have a valid email due to an old mailing list, alias, etc. In order to unify these data identities, we need master data, which is stored in our service database (MySQL). But, the difficulty comes in how we can load and unify data from multiple data sources. We can resolve this data unification issue by using Treasure Data. 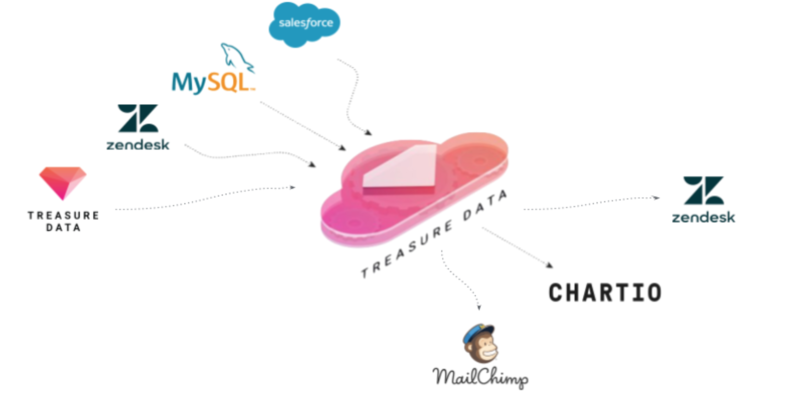 Additionally, the Treasure Data Service uses Treasure Data to manage log analytics to store all service logs in Treasure Data. So, we can enrich a customer’s information anywhere with their history of service activity and contract and customer support activity and more. If you are not our customer (unfortunately), you might feel this article is not helpful. It’s not true. We love open source, and we love to help people who need to do data engineering in the world. In this case, we recommend Embulk (http://www.embulk.org/docs/), which is an open-source bulk data loader that helps data transfer between various databases, storages, file formats, and cloud services. Our Data Connector is also based on Embulk. And, a lot of connectors are the same source code as open source plugin. Now, you have all your data from multiple data sources in the Treasure Data platform. Next, I’d like to push these data to User Fields in Zendesk. Unfortunately, for now, we don’t support a connector to export data from Treasure Data to Zendesk User Fields. As I mentioned, Embulk supports a pluggable architecture. That means it’s easy to develop a plugin for integration to Zendesk User Fields. So, I have developed the following plugin. embulk-output-zendesk_users enables to update user_fileds in Zendesk by Zendesk User ID. With the following plugin, you can pull data from Treasure Data, and push it to Zendesk User Fields by using Embulk. Before Embulk is executed, you need to define User Fields in Zendesk. And then, you can update the defined user field by Embulk. Now you can get any information from SFDC and etc… into Zendesk User Fields. 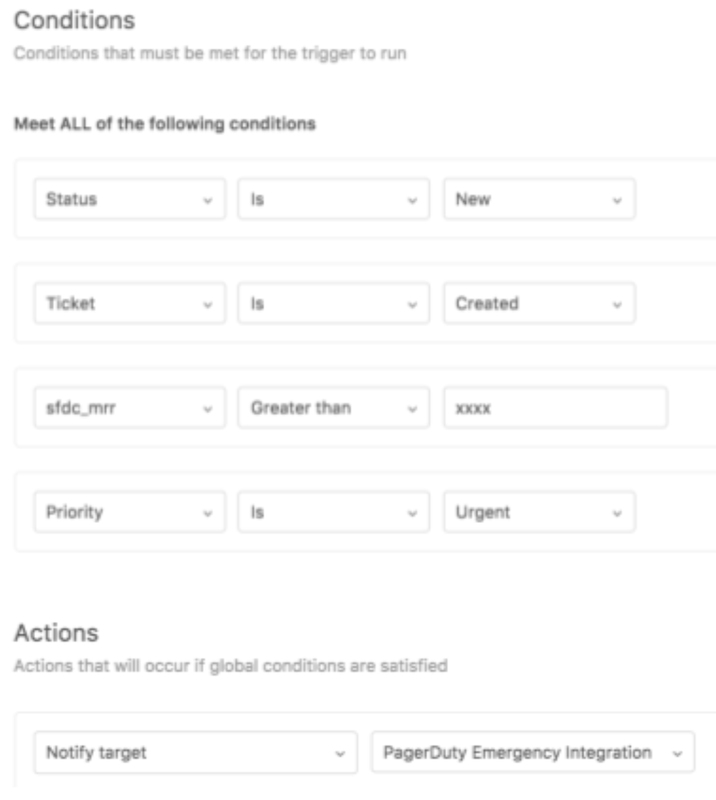 Finally, you can do the following conditions with Zendesk User Fields in Zendesk Trigger! 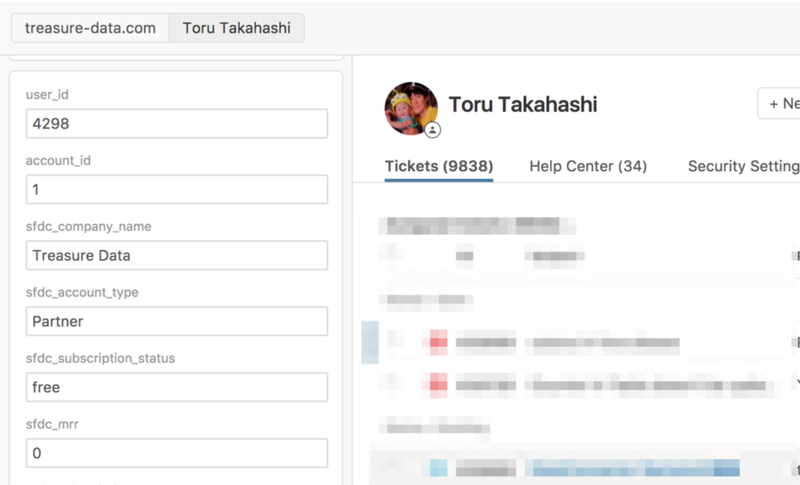 Through the above processes, you already have support ticket information from Zendesk. Next, Treasure Data provides connectivity to BI tools. So, we also use Treasure Data and Chartio for our data analytics platform with customer support Information. For now, we can do information sharing more easily without any special work. The following graphs show examples of our dashboard in Chartio. This is a support activity dashboard per quarter for the support team. 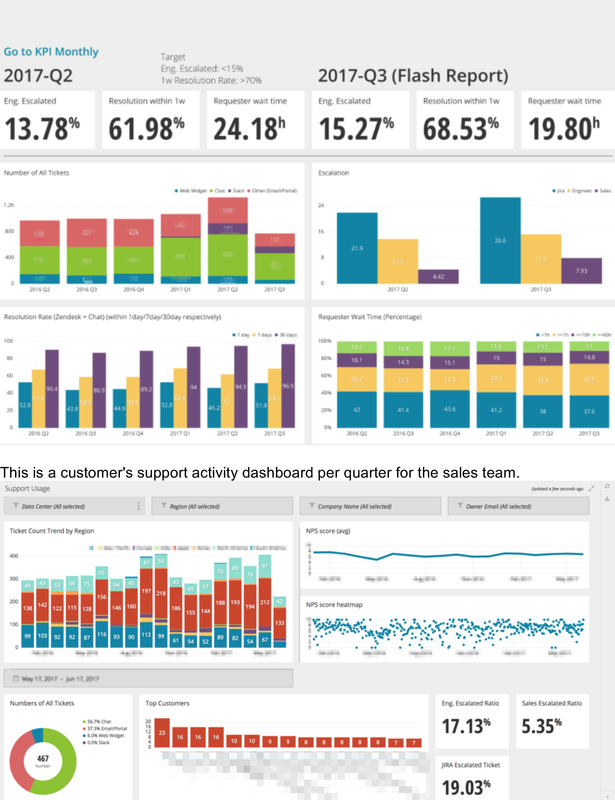 We can build these dashboards easily because all related data is stored in Treasure Data. In this blog post, I introduced how the Treasure Data support team improves our internal analytics and tools. In order to integrate with several services, we use Treasure Data as the complete underlying data unification platform. For an enterprise SaaS company, support is an important factor for growth. Having support seamlessly data-driven for our customers is critical. I hope his blog post helps you achieve similar results. BTW, we’re a growing global team. If you’re interested in joining our support team, please check this page! Toru has been leading a global team of technical support engineers since the company's founding. As the 2018 Gartner Magic Quadrant recognizes, Treasure Data ranks third for overall support in Data Management Solutions for Analytics.